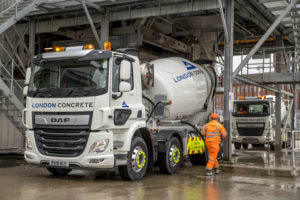 DAF Trucks will debut its new CF Construction ‘FAD’ eight-wheeler dedicated mixer chassis at the UK Concrete Show. The new 8×4 mixer chassis weighs 250kg less than its predecessor despite a number of specific enhancements designed to improve productivity, efficiency and comfort. It retains the important eight cubic metre capacity, with a choice of PACCAR MX-11 engines in 370hp, 410hp and 450hp configurations. The new TraXon 12-speed automated gearbox is designed for optimum performance on and off-site, while a 16-speed manual option is also available. The new CF mixer also gains the updated interior, enhanced climate control and configurable switchgear in common with the rest of the CF range. Another ‘FAD’ chassis set to be on display on the Liebherr stand is the company’s latest HTM 805 lightweight drum and equipment. The truck goes into operation with TM Mixer Hire of Woking.